The new world was an unspoiled frontier perfect for colonization, a virtual paradise of boundless beauty and limitless resources, untouched by human hands...but not untouched, as the unsuspecting colonists soon discovered. Now marooned on a planet infested with the deadliest Alien species ever encountered, the colonists learn firsthand the Law of the Jungle: adapt or become extinct. And a little helping hand couldnt hurt, inexplicably provided by the selfsame Predators who destroyed the colonists ship and made them prisoners in paradise. Are these extraterrestrial hunters actually showing sympathy for the humans plight, or do they have something even more monstrous in mind? Following the events of _Aliens vs. 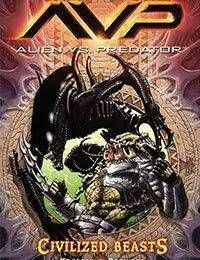 Predator: Thrill of the Hunt_, _Aliens vs. Predator: Civilized Beasts_ again teams writer Mike Kennedy (_Star Wars, Lone Wolf 2100_) and artist Roger Robinson (_Batman: Gotham Nights, Doctor Solar_) in an action-packed battle royale to determine the heavyweight championship of the galaxy!